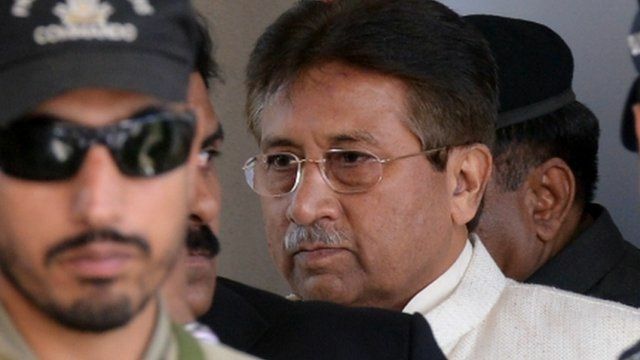 Pakistani police arrest Musharraf Jump to media player Pakistani police have arrested former President Pervez Musharraf and presented him in court. Musharraf bail extended amid chaos Jump to media player A court in Pakistan has extended bail for former President Pervez Musharraf, amid chaotic scenes in which a shoe was thrown at him. Musharraf quick get-away from court Jump to media player The former president of Pakistan Pervez Musharraf speeds away from a court in Islamabad which had ordered his arrest. Musharraf returns to Pakistan Jump to media player Former Pakistani President Pervez Musharraf has arrived back in Pakistan, ending four years of self-imposed exile and defying death threats. Pakistani police have arrested former President Pervez Musharraf and presented him in court. A district court judge ordered General Musharraf to be held under house arrest for two days. Orla Guerin reports from Islamabad.